September 15, 2013 September 15, 2013 Posted in Travel Posts. I had a few things to get done in Osaka while I am there and no doubt I am going to wander around a lot, but first I had to get there on my own with what limited Japanese I know. I was up and out by 09.10 and jumped on the first bus out of Hotani, I realised once on the bus this might of been a huge mistake as I had no idea where the bus was going but my theory was that all buses head to at least one of the train stations. Luckily I was right and ended up at Tsuda train station which is close to Hirakata city, quickly figuring out that I needed to pay ¥450 to get to Osaka I got the train out. When you compare Japan to countries like Thailand it comes across as being an incredibly civilised nation. Like I said before trains are huge and clean but also very quiet, mobile phones and the use of on public transport is frowned upon , almost everyone has a smartphone here and you can see people listening to music or playing a game or reading a book. When you have come from a loud environment like Bangkok its a huge change. There is something odd about the whole thing though and that is simply that it all seams a little too perfect. Men are well groomed and even the ones that are trying to put across their individual style still have perfect hair. A scruffball like me who has limited clothing, no real style to speak of, a beard (beards are very rare in all of Asia) travelling through the system must be a bit of a change for them, but not so much as they stare. When something seems so perfect I tend to think what is it that people are trying to hide behind it? I wonder how many have been afraid to embrace something that may differ from the norm. Anyway back to my adventure in Osaka city, I spent the first hour or so just wandering randomly and sort of towards a store I wanted to check out. The store in question is called Kojitsu Sanso, Lonely Planet tells you in a certain place and as per usual is out of date. This is where my minor understanding of Japanese really came in useful, I entered a shop that was occupying the space the shop I wanted was supposednto be, apologised for my minimal understanding of Japanese and asked where the shop is. They told me it’s totally in the opposite direction in the Grand plaza. I turned around and found my way to the right plaza through then network of underground tunnels and after a while I found the right place. With new purchase in hand I began to explore more of Osaka, I had a fair few hours to go until I needed to be in a certain place so I could just let myself wander. I did qant to go ti the Aquarium in Osaka but I only bought out a minimal amount of cash with me so that meant I had to be really careful on what I spend. For any travellers on a budget I highly advise you only take out what you can afford to spend or lose. Don’t take cards and suchlike if you can help it. I roamed the streets and checked out a few of the huge malls when this caught my eye. Is that a ferris wheel sticking out of a building? Yep, it is, I had to see this thing up close. 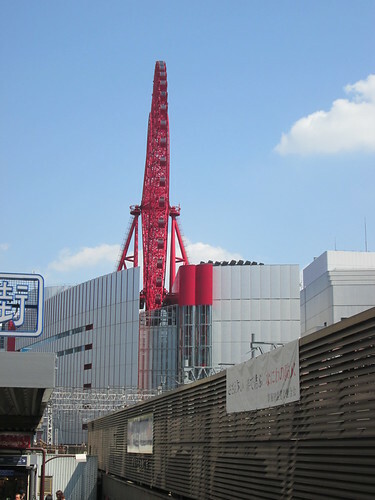 Finding the Ferris wheel was not that hard, I headed into t shopping mall known as HEP Five there on the list of things on the 7th floor is the entrance to the Ferris Wheel. Okay the wheel is not huge and it’s no London Eye but I was excited to get on it. There is a video of me on this wheel but that will come in moment. That was my main highlight of Osaka City I didn’t get time to explore too much more than I had but I will probably do so another time. I had something planned for the evening and I really want to share that with you. So you may or may not know that the Japanese are fairly serious about their baseball. The crowd get really into it. It just so happens that it is currently baseball season and I mentioned to the people on the farm that I would like to see a game. Oshima san said he has a friend who might also like to go and if I would like he would arrange and buy the tickets for me. This is much better than the alternative option which is a website that offers to buy the tickets and charges you a $59 USD fee per purchase which is sold by the website as a ‘Generous Tip’ but if you ask me a total rip off. Still thanks to some nice Japanese people I don’t have to do this and managed to see the Hanshin Tigers (home team) play against the Chinuchi Dragons and sadly the Tigers lost by one point. 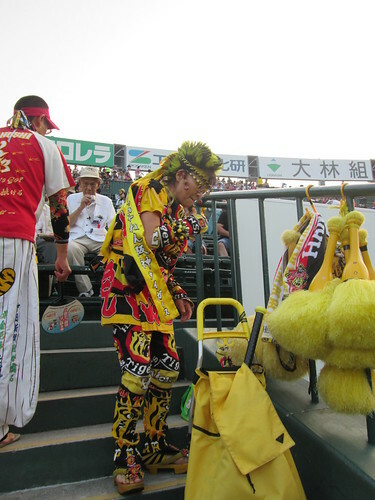 Still the game was awesome and there are some serious fans out there of the Hanshin Tigers, they get fully decked out in the gear, just take a look at this particular fan. Consider for a moment that an official cap costs a total of ¥6,500, if you add up everything this lady has on and yes they are her pompoms I would estimate it might be around ¥50,000, of course for all I know she could be one of the players mothers or aunties or something. So along with the video of me on the Ferris Wheel is accompanied by some footage of the Baseball game. I hope you enjoy it, for people who have this via e-mail select this link. For people viewing on the website just scroll down.